If you're a fan of of indie games for the iPhone, then this sale's totally for you. Hot on the heels of the Humble Indie Bundle #2, another group of game developers have put together a sale that benefits the Child's Play charity. However, there are a couple of differences between this and the Humble Indy Bundle: these games are all for the iPhone and you don't have a choice on the price. 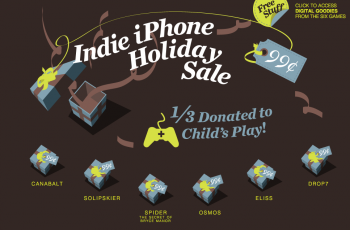 Dubbed the Indie iPhone Holiday Sale, the games are selling for $0.99 each. As opposed to the Humble Indie Bundle, which lumps its games together into one unit and allows shoppers to name their own donation amount, this is a non-negotiable amount. One third of the price (after Apple's cut is deducted) is donated to Child's Play. The sale is currently going on until December 31. The sale includes the following games: Canabalt, Solipskier, Spider: The Secret of Bryce Manor, Osmos, Drop7, and Eliss, all of which we can safely say are required for your iPhone to work properly. I've played Spider and Osmos, and those two games alone totally make the sale a worthwhile purchase if you have an iPod Touch or an iPhone. Plus, you know, the fact that it's a little more money to an incredibly worthy charity.